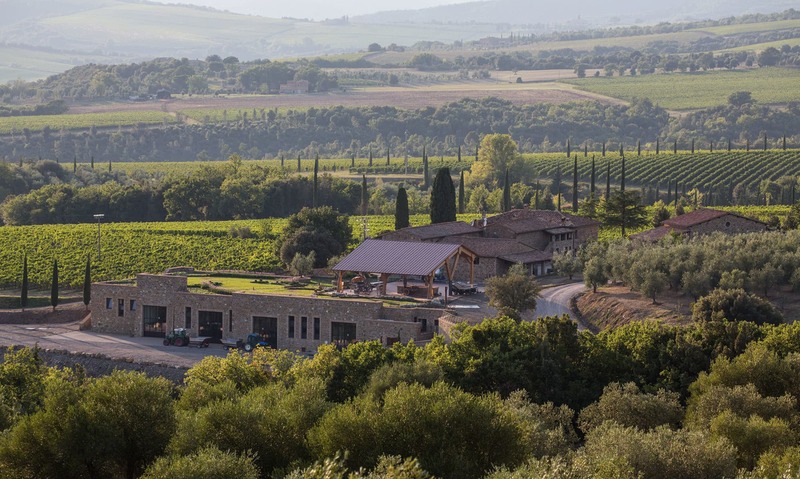 The Caprili estate spreads out over an area of 58 hectares in the southwest territory of the Municipality of Montalcino on the hillside which slopes down towards the Orcia and Ombrone rivers. Of the total property, 15.5 hectares of the land is covered with vines. Sangiovese Grosso is cultivated on a total of 14.5ha for Brunello di Montalcino D.O.C.G. and Rosso di Montalcino D.O.C.G. Trebbiano, Malvasia and Vermentino varieties are planted on 0.8 hectares of land for S. Antimo Bianco D.O.C., while Moscadello is grown on the remaining 0.7 hectares in order to produce wine of the same name, Moscadello di Montalcino D.O.C. The estate also has four hectares of olive groves for its excellent extra-virgin olive oil classified with the marque “Denominazione di Origine Protetta Terre di Siena” – Protected Denomination of Origin for oil produced in the area of Siena.